Dedicated to the important Italian event Pitti Immagine Uomo. A well dressed couple walking down the stairs in Florence. La Moretti. L'Amore. Love. Love for beautiful arts, fashion, style, history, good cuisine, travelling, fantastic views and landscapes. Love for Italy. Nadia Antosina, La Moretti, Latvian born and Italy based Fashion Illustrator, specialized in Fashion and Lifestyle illustration with the particular interest for History and Costume. draws can lose track of time. Traveling around the world has influenced strongly her professional and private life. illustrations is the Woman with her unique emotions. She considers her style as quite realistic and it's hand done digital art. love and emotions with the world through her illustrations. She is a happy wife and mother of a wonderful 3 year old boy. Dedicated to the famous Carnival in Venice. 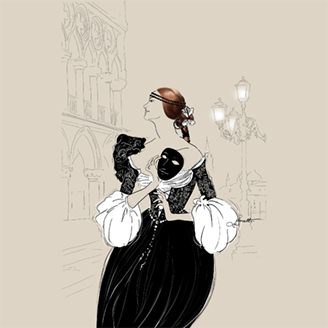 Beautiful redhead lady is holding the antique black velour mask known as "La Moretta". Self-portrait. 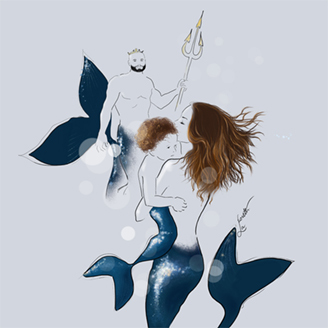 A family consisting fictional characters: a mermaid with her baby, and the father Triton behind her.